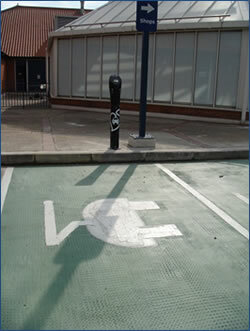 From March 31st, six Electrical Vehicle Charging Pods will be available to use free of charge at The Putney Exchange. Normal parking charges still apply. This exciting initiative, working in partnership with Source London, aims to encourage the use of electric vehicles and promote the message of more environmentally friendly driving. It’s also in response to the well documented and unacceptably high levels of pollution present in Putney. The charging pods will be free to use as part of a campaign by Source London to help drive down pollution in town centres. Source London is a city-wide charge point network key to delivering the Mayor’s vision for increasing the uptake and usage of electric vehicles and his goal for London to be the electric vehicle capital of Europe. The move forms part of refurbishment works heralding a new retailing era at The Putney Exchange and Putney High Street. In addition to the creation of six EVCP’s, changes are also being made to the rooftop level of the car park which will be extended to create an additional 45 shopper car parking spaces.